“All that glitters… is not gold” applies particularly to the social sciences, in its vocation to go against common sense and counter class, origin, age, and gender prejudices. This is why research on life course jumped at the opportunity of the 10th edition’s theme, on the 5 and 6 July 2014, to present some activities inspired by scientific data and methods in an entertaining way. Researchers at the Swiss National Centre of Competence in Research LIVES, especially those from the Interfaculty Centre of Gerontology and Vulnerabilities Studies (CIGEV) at the University of Geneva, will be proposing two activities. To start with, come discover the life course calendars, a tool that is very much used in research on life course to track individual trajectories in different life domains: residency, family, professional activity, health. Life calendars show particularly well interactions between private and work life. By using this method, we have traced the biographies of several prominent figures, which visitors will have to guess thanks to the events along these personal life histories. 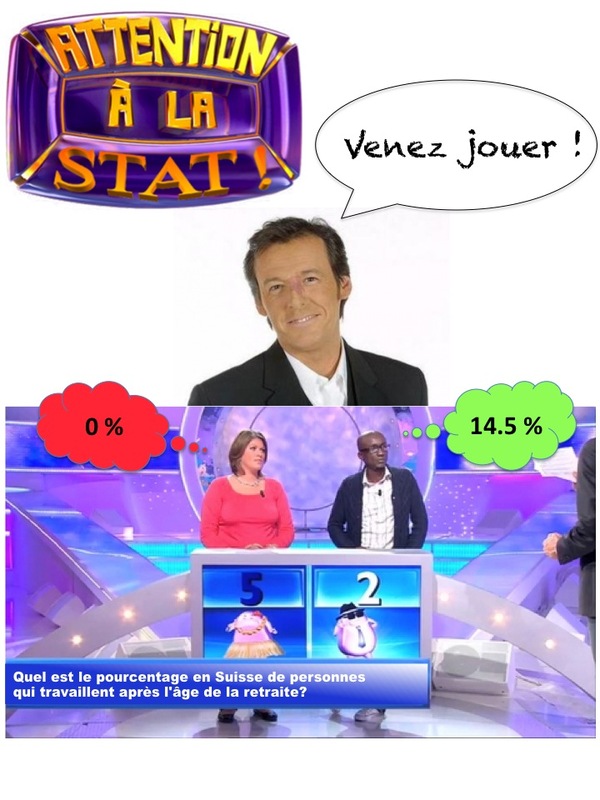 The highlight of the LIVES stand is a parody of a famous French TV game-show, “Mind the Step”, which was renamed “Mind the Stat” for the occasion. Following the model of the original programme, the visitors to the Night of Science may confront each other in pairs on questions about the Swiss society. In order to win, they will have to get as close as possible to the correct figures and be quick. The software that was especially developed for the occasion will also be available in a child-friendly version. From July 15 to 19, 2014 in Lausanne, this event will cover a wide variety of topics, including: personality, health and well-being; personality and work and organizational psychology; personality, motivation, and emotion; and many others. Members of the NCCR LIVES IP7 are on board. The 17th European Conference on Personality will propose 7 keynote presentations, 11 invited symposia, 30 open-call symposia, 24 paper sessions, 2 poster sessions, and 3 pre-conference workshops. Prof. Jérôme Rossier, head of the IP7 within the Swiss National Centre of Competence in Research LIVES at the University of Lausanne, is chair of the local organizing committee and is assisted by co-chair Dr. Marina Fiori from the University of Lausanne. Both are part of the international scientific committee. The local organizing committee also includes other members of IP7: Prof. Franciska Krings, vice-rector of the University of Lausanne, Prof. Willibald Ruch from the University of Zurich, as well as Dr. Koorosh Massoudi and PhD Student Claire Johnston from the University of Lausanne. On Wednesday 16th July, Claire Johnston will present “Changes in well-being and professional change: the role of career adapt-abilities and personality traits”, with Christian Maggiori and Jérôme Rossier as co-authors. On Thursday 17th July, Dr. Christian Maggiori, another member of IP7 at the University of Lausanne, will present “The role of personal characteristics in an unstable professional context”, with Claire Johnston and Jérôme Rossier as co-authors. Claire Johnston also organizes a lunchtime meeting on Thursday 17th July for PhD students and young researchers, called “Publishing in the European Journal of Personality: Overview & Tips” and presented by Wendy Johnson, Editor of the European Journal of Personality, along with the associate editors. The XVIII ISA World Congress of Sociology will take place in Yokohama from 13 to 19 July 2014 under the title “Facing an Unequal World: Challenges for Global Sociology”. Some members of the Swiss National Centre of Competence in Research LIVES will join the hundreds of participants to present a paper. Also to be noted,Francesco Giudici (IP13) is co-author of a paper presented by Ping-Yin KUAN, from the National Chengchi University in Taipei City (Taiwan): An Inter-Cohort Comparison of Intra-Cohort Social Stratification: How Do Cumulative Dis/Advantages Evolve Across Cohorts? The University of Applied Sciences and Arts – Western Switzerland (HES-SO), the State of Vaud and the National Centre of Competence in Research LIVES organise the 5th Summer University in Social Work from June 30 to July 11, 2014 in Lausanne. Many speakers will present LIVES research. Students from all over the world will participate in the next Summer University in Social Work. They come from the United States (University of California Los Angeles - UCLA, and Boston College), Canada (University of British Columbia, Vancouver), Burkina Faso (Institut National de Formation des Travailleurs Sociaux, Ouagadougou), India (Rajagiri College of Social Sciences, Kochi), China (Shandong University) and Switzerland (HES-SO). Among the professors we find many LIVES members: Michel Oris and Stefano Cavalli (IP13), Jean-Pierre Tabin and Jean-Michel Bonvin (IP5), Jean-François Bickel (IP5, IP13), Claudio Bolzman (IP2, IP13), Marianne Modak (IP8). The general coordination is ensured by Prof. Marc-Antoine Berthod from the HETS&SA l EESP, Lausanne, which is one of the HES-SO schools. The theme of this edition is “Vulnerability, Empowerment and Social Work”. The complex interrelations between vulnerability and empowerment will be discussed, “two central concepts that are too frequently grasped separately in theoretical approaches”, the programme says. The Summer University in social work aims at promoting exchanges between participants from various backgrounds, at facilitating comparative analysis and at stimulating new theoretical and professional approaches in social work. It offers a privileged place for discussions and debates to professors and students coming from many different countries. The biennial congress 2014 of the European Association for Population Studies (EAPS) is about to start on 25th June for four days in Hungary. The theme of this edition is « Transitions: Opportunities and Threats ». Some researchers from the Swiss National Centre of Competence in Research LIVES will speak about changes in family settings, immigrants, ageing, and mortality. “Fundamental changes started 25 years ago in the Eastern part of Europe, opening a new chapter in the history of the Continent. Even though the transformation of population processes is not complete, making an inventory from the perspective of a quarter century is both achievable and advantageous. It is worth asking more questions: whether a new pattern of demographic behaviour has emerged, how much it is different from other regions of Europe, and what mechanisms shaped population processes in the Eastern part of Europe.” This statement by the local organizers opens the programme of the EAPS 2014 Conference. Some of the NCCR LIVES demographers will present their research or are co-author of a paper in the following sessions. 23-2 Young adults' excess mortality: individual reality or yet another heterogeneity's ruse? An interdisciplinary workshop on June 26-27, 2014 organised by the NCCR LIVES and the IUMSP (CHUV) at the University of Lausanne will bring together researchers in the social sciences and in medicine to share their experience in collecting longitudinal data. Longitudinal panel data have been collected for a long time in several scientific disciplines, especially in health sciences and social sciences. In health sciences, data are often partly composed of results of physiological or experimental repeated measures of biomarkers. In social sciences, data are collected in order to estimate the impact of an event or a change in the behaviours or attitudes of people interviewed, as well as to follow people during their life course. Perspectives from the two disciplines have crossed in recent years: measures of biomarkers have been introduced in several social sciences panels while social questionnaires have been introduced in health sciences longitudinal cohorts. Despite this crossing issue, research traditions based on panel studies vary between these disciplines, as can be seen in ethics debates: for example, questionnaires on social networks can be considered intrusive in health and medical sciences, while mixing physiological measures and questionnaires is not always well perceived by social scientists. The aim of the workshop is to discuss these different issues. A first session will be devoted to the different kinds of panel surveys. An interactive perspective between disciplines will be the object of the second session. The third session will be devoted to methodological issues. Invited speakers, coming from both disciplines, will speak about their experience in collecting longitudinal data. This event is organised by Jean-Marie Le Goff (NCCR LIVES IP15) and Joan-Carles Suris, from the Institut universitaire de médecine sociale et préventive (IUMSP) of the University of Lausanne & CHUV. The National Centre of Competence in Research LIVES is organizing an interdisciplinary, comparative workshop at the University of Lausanne to explore the various forms of single parenthood and their consequences on the life course. The symposium will be held on June 6 and 7, 2014 and will include fifteen speakers from several countries. Since the 1970s, the number of children not brought up within a traditional family - with their biological parents united in marriage - has been constantly growing. In the past, parents bringing up their children alone were either widowers or widows, or what were then referred to as "gymslip mothers", with all the weight of the moral judgement contained in that label at the time. This situation has changed with the rising rate and acceptance of divorces, increased life expectancy, more widely available contraception and the legalization of abortion. Has "enforced" single parenthood now been replaced by "chosen", or at least accepted, single parenthood? And more importantly, what challenges do those single parents face nowadays? These are just some of the aspects that will be dealt with by the "Lone Parenthood in a Life Course Perspective" workshop, on June 6 and 7. It will be held at the University of Lausanne and is organized by the NCCR LIVES in partnership with the universities of Berne and Geneva. "Research into lone parenthood is still too often limited to the aspects of poverty and marginalization. But the reality of solo parents is more multi-facetted", explains the main organizer, Prof. Laura Bernardi, deputy director of the NCCR LIVES. She hopes the symposium will be an opportunity for "fruitful discussions to improve theoretical knowledge on the diversity of family types and empirical knowledge of the experience of single parents in terms of needs and resources". She hopes to be able to arrive at "suggestions how social policies can respond to this problematic." There will be around fifteen presentations, with sociologists, demographers, psychologists and political scientists from Germany, France, the United Kingdom, Ireland, Belgium, Finland, Poland, Hungary, the United States and Australia. Quantitative, qualitative and mixed methods will be represented in this program, and several studies are using longitudinal data. The two keynote speakers will be Dr. Marie-Thérèse Letablier-Zelter, from the Economics Centre at the Sorbonne, University Paris 1, and Dr. Anne-Laure Garcia, researcher at the Marc Bloch Centre and at the University of Potsdam. Dr. Anne-Laure Garcia will give a lecture called "The Construction of Single Mother identity in French and German State-Orders", from her book Mères seules. Action publique et identité familiale (Single mothers. Public Actions and Family Identity), published in 2013 by Presses universitaires de Rennes, following the completion of her doctoral thesis. The researcher shows how legal and institutional factors affect the norms and the perception of individuals, in this case, single mothers. This research is based on a structural analysis of narrative interviews conducted between 2008 and 2010 with women who became single mothers between 1977 and 1987, i.e. after abortion became legal and prior to German reunification. Anne-Laure Garcia has demonstrated how the state sector impacts how these women relate to motherhood: in East Germany, for example, the fact that jobs, housing and childcare were guaranteed allowed a degree of emancipation of single mothers, who were much more numerous than in West Germany, where the traditional role of women in the home was predominant. Single motherhood was also more readily accepted in East Germany than in France, where the concept of single mothers "on benefits" promoted a more negative image. The comparison has led the researcher to define three processes common to all these situations: "the internalization of the universe of possibilities", "the structuring of expectations" and "the self-understanding in matters of external ascriptions". Parental identity is constructed in a context of overlapping with social policies. The lecture by Dr. Marie-Thérèse Letablier-Zelter will be on "Breaks and Discontinuity in Family Life: the Case for Single-Parent Families". She will deal with the problem of defining single-parent families and the broadness of the definition, when most children who grow up in this situation in fact have both their parents. By reviewing the different types of families referred to as single-parent families, the researcher will differentiate several socio-economic-demographic profiles and will be looking at the different paths - temporary or sustained – of single parenthood. Not surprisingly, long-term situations of lone parenthood are generally those of single mothers from disadvantaged backgrounds. Finally, she will investigate the effects of single parenthood on parents and their children, on the management of co-parenting and on the status of the third parent in "non-traditional" families. For Marie-Thèrèse Letablier-Zelter, the term "lone parenthood" is no longer suitable and can refer to different situations - either purely the physical aspect of where the children live, or the economic and social aspects of resources, or even the legal and educational aspects of parental authority. "In France, over half of children are born outside marriage. Therefore, marriage is no longer the basis for families. Although single mothers are no longer subject to moral stigmatization, we can still talk of social stigmatization, as the rate of poverty among this group is generally higher than among couples and it is more difficult for single mothers to access the labour market", states Marie-Thérèse Letablier-Zelter. She fears that "the trivialization of this type of parenthood leads to a lack of interest in the real socio-economic and legal challenges posed by the new family types". Finally, the symposium will deal with other aspects of single parenthood, such as well-being, social networks, and the physical and mental health of the parents and also the social success of the children. These issues will no doubt flow into NCCR LIVES's thinking in its own current project on single parenthood.